Creatus WordPress Theme version 1.2.0 brings much more than just few additional options and code improvements. 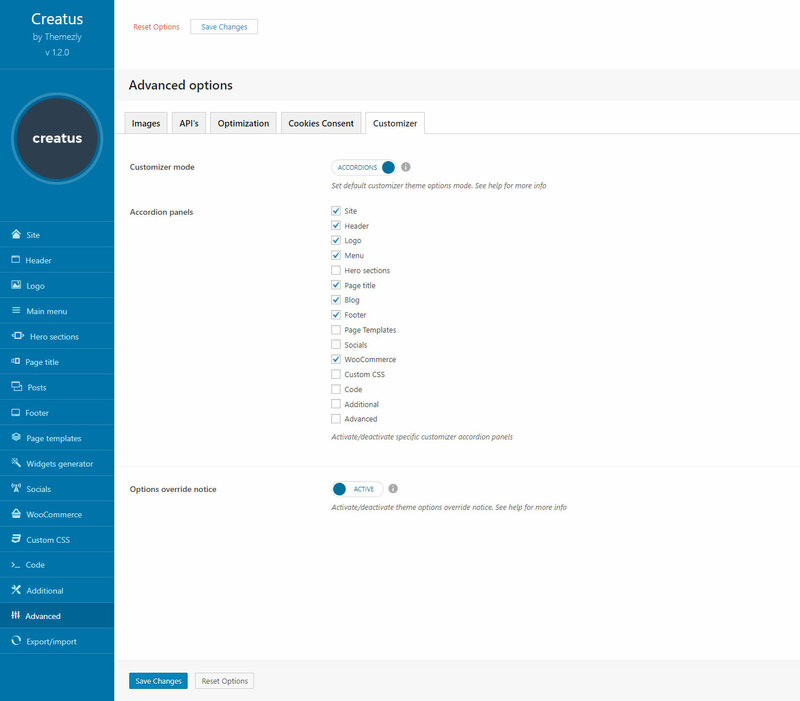 This time we have decided to bring backend theme options to WordPress native customizer. We also added few things that will improve your customizing experience. Up until now you might have only seen default accordion panels in your WordPress customizer but those come with a heavy price. The more accordions and settings you have the slower the first page load. 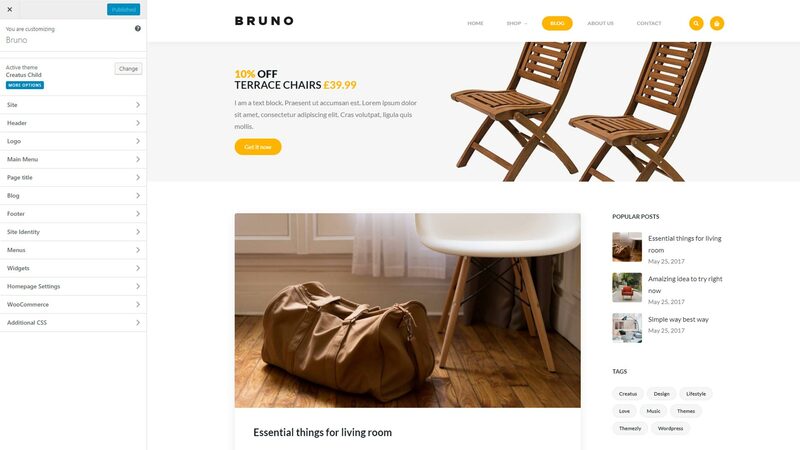 In order to give you all the options that control the theme layout and style, we had to come up with something new. At the same time we also had to lower the page load. The answer to our problems was options sets popups. Before accepting this idea we asked on different social channels what customizer users think about it. To our surprise the votes were 60:40 in favor to accordions. Looking at the polls outcomes we simply had to give you both. The default mode is of course accordions. For those of you who like to work in sets and dont mind adjusting more than one option before the iframe change the popups are the perfect fit. 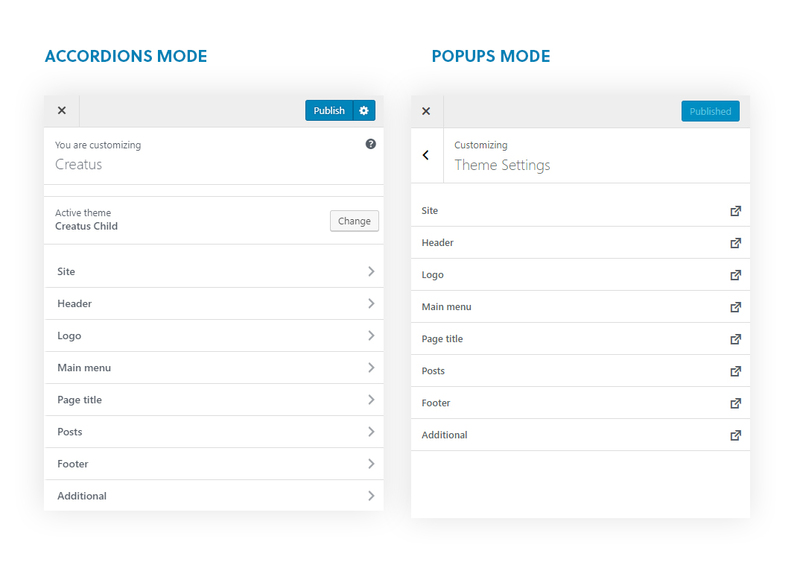 And another advantage of popups mode is that you can load all available panels without a page load increase. So there you have it, different modes and everyone is happy! In order to improve the accordions mode and give you a significant page load increase we are initiating the sections options only when you open the section. So when you click on a specific section for the first time you will see the options fade in or should we say lazy-load. This little trick has tremendously improved the first load and we were able to add all the options that you might need. Conditional cusomizer options is nothing new but we took full advantage of it and we show a specific options panels only if you are on the conditional page. For example, if you are on the blog archive there is no need to show you WooComerce, Portfolio or Events panels. These are hidden until you access their pages. This way you can concentrate on a specific options set only. As you might already know Creatus comes with page theme options overrides. 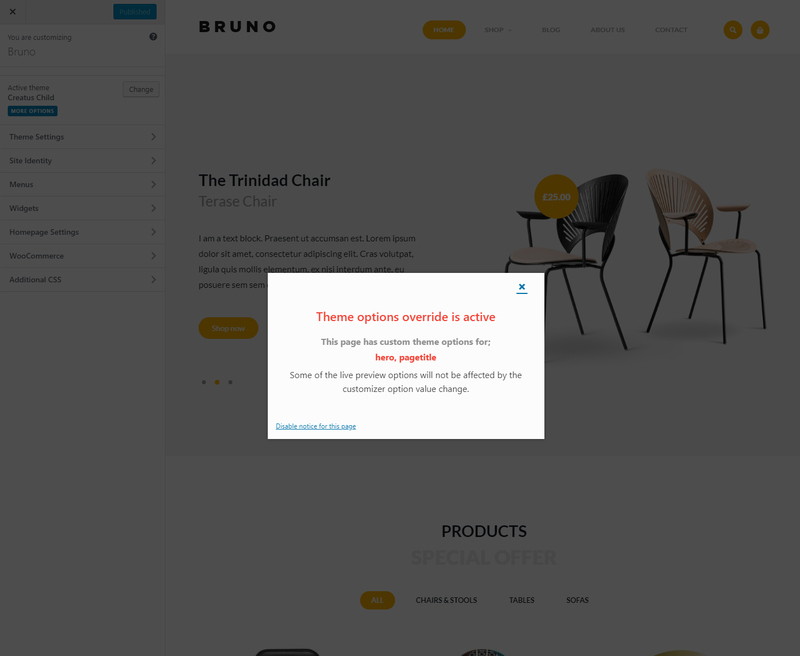 Since the customizer options are synced with backend theme options, customizer is not able to change the options that are overriding the theme options. In such cases we are displaying a popup notification. The notification gives you the info about the page options sets that might not be customizable. There is also a disable notification backend setting or a disable notification for customizing session link that can turn these off for you. Now that Creatus is fully customizer ready you can adjust your website faster than ever and still enjoy all the premium theme features. So go ahead download Creatus WordPress Theme and start customizing!